NEW YORK (AP) — Customs and health officials began taking the temperatures of passengers arriving at New York's Kennedy International Airport from three West African countries on Saturday in a stepped-up screening effort meant to prevent the spread of the Ebola virus. "Already there are 100 percent of the travelers leaving the three infected countries are being screened on exit. Sometimes multiple times temperatures are checked along that process," Dr. Martin Cetron, director of the Division of Global Migration and Quarantine for the federal Centers of Disease Control and Prevention, said at a briefing at Kennedy. Cetron added, "No matter how many procedures are put into place, we can't get the risk to zero." The screening will be expanded over the next week to four other airports: New Jersey's Newark Liberty, Washington Dulles, Chicago O'Hare and Hartsfield-Jackson in Atlanta. Customs officials say about 150 people travel daily from or through Liberia, Sierra Leone or Guinea to the United States, and nearly 95 percent of them land first at one of the five airports. 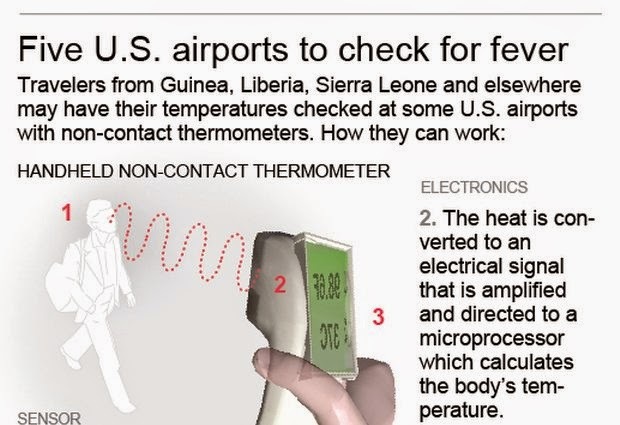 Public health workers use no-touch thermometers to take the temperatures of the travelers from the three Ebola-ravaged countries; those who have a fever will be interviewed to determine whether they may have had contact with someone infected with Ebola. There are quarantine areas at each of the five airports that can be used if necessary. President Barack Obama said Wednesday that the new screening measures are "really just belt and suspenders" to support protections already in place. Border Patrol agents already look for people who are obviously ill, as do flight crews. Health officials expect false alarms from travelers who have fever from other illnesses. Ebola isn't contagious until symptoms begin, and it spreads through direct contact with the bodily fluids of patients. Cetron said more than 36,000 travelers leaving West Africa have been screened for Ebola in the last two months and none was infected with Ebola. The extra screening at U.S. airports probably wouldn't have identified Thomas Eric Duncan when he arrived from Liberia last month because he had no symptoms while traveling. Duncan, the first person to be diagnosed with Ebola in the U.S., died Wednesday in Dallas. Experts say the federal government has broad authority to screen passengers and quarantine them if necessary. The CDC cited as legal authority the Commerce Clause of the Constitution, under which the government regulates trade with foreign countries. The 1944 Public Health Service Act also allows the federal government to take action to prevent communicable diseases, which include viral hemorrhagic fevers such as Ebola, from spreading into the country.